The camera has been witnessing and shooting the darkness of war and conflict since the photographic process was invented. From locations all over the world, images show us what a county at war looks like, what torture can do to a human spirit and what displacement and exile can mean for a migrant. Some of the most instantly recognisable images in the lexicon of the medium were made in conflict situations. Such as the Vietnam War image by Nick Ut of a screaming naked child, running, her skin burnt following a napalm attack; the Bloody Sunday image by Fulvio Grimaldi of Fr Edward Daly waving a white handkerchief as he tried to lead a group of people carrying the body of a victim across a car park; the tragic image of the little Syrian boy Alan Kurdi washed up on the Greek Island of Kos never reaching the promised land. Images of human rights' abuses just keep on coming from Iraq, Afghanistan, Syria and Yemen. Photojournalists in conflict zones are witnesses who tell us this is so and, on the other hand, say this should not be so. They expose the violence but can do very little to explain it. In the absence of a wider social and political human engagement with the events photographed, images of suffering and injustice may, as many theorists have argued, merely lead to the creation of so-called compassion fatigue. One image of suffering is quickly replaced by another. We the viewers are moved by what we see, but may feel powerless to stop it. Yet we cannot deny the visual evidence of the photographed event. The image says this human rights abuse happened and the photograph of it is now part of the history and memory of that time and place. When that documenting is supported by the appropriate social and political response, the power of the image to effect change can achieve a powerful currency. Perhaps in no other area of conflict did the witnessing of an event, and the story the imagery told, play such a vital role in the investigating of conflicting and contested narratives than in Northern Ireland during the Troubles. In particular, the visual evidence and symbolic power of the images made during that period played a major role in seeking justice for the victims of Bloody Sunday. 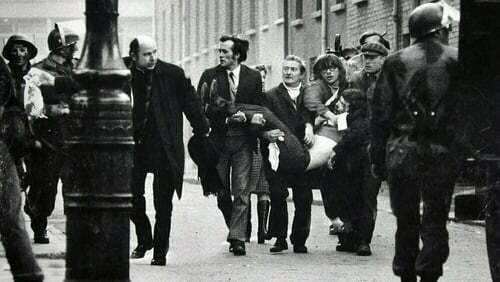 On Sunday January 30th 1972, 13 civilians were shot dead and 15 injured during a civil rights march held in Derry in protest against the policy of internment without trial. The events of that day were photographed and filmed both by local and international media and published across the world. However, despite the number of images recorded, the exact circumstances surrounding the deaths of the demonstrators remained disputed for over 30 years, resulting in the Widgery and Saville public inquiries. What separated both inquiries was the evidential value given to the photographs made on that day and their role in establishing the truth of what happened. The first inquiry headed by Lord Widgery took three months to deliberate. Among the most famous pictures of that day were taken by two freelance photographers Grimaldi and Gilles Peress and both gave oral evidence to the inquiry. It became clear early in the proceedings that the photographs represented a real challenge to the official version of the events of that day. The transcript of the hearing shows that Grimaldi in particular was questioned in a very aggressive way and was even accused of being a friend of the IRA. This tense relationship between the photographers and members of the inquiry displayed a fear that embarrassing truths would be revealed to challenge the official version of events. In the 38 years that passed between that first public inquiry and the Lord Saville report in 2010, the images recorded on that day became a powerful tool in the rewriting of the official version of Bloody Sunday. They became live documents of protest and subversion finding expression in the media, photo books, exhibitions, public and private archives and helped strengthen the case put forward by the campaigners who were demanding a second inquiry. The photographs were first used to discredit the official version of events set out in the Widgery, and then as a tool to reconstruct the new version for the Saville Inquiry. In terms of the physical landscape, much had changed since 1972. Photographs were used to help witnesses remember the layout of a particular area, or to help resolve the location of a street. They served to establish the chronology of some events or establish the time the event occurred. Unlike Widgery, Saville included a great number of the photographs in his final report. By re-integrating these photographs in the official process, and in the subsequent report the witnessing of the photojournalists of that day, were given the status of "truth tellers". The report concluded, inter alia, that contrary to the previous official version of events, soldiers had fired on unarmed civilians who were not posing any threat. The many photojournalists and filmmakers documenting the events of Bloody Sunday may have been unaware of the important role their images would play in the exposing of human rights abuses. In the absence of that wider social and political human engagement with the events photographed, one could argue the fate of the images would have followed a similar trajectory to previous war images; their influence reduced to a mere iconic symbol of a subjective truth. Photojournalists are responsible for the ethics of showing us what they see, but we are responsible for how we use the images. The photograph illuminates the darkness, but it is the viewer who must make it speak.